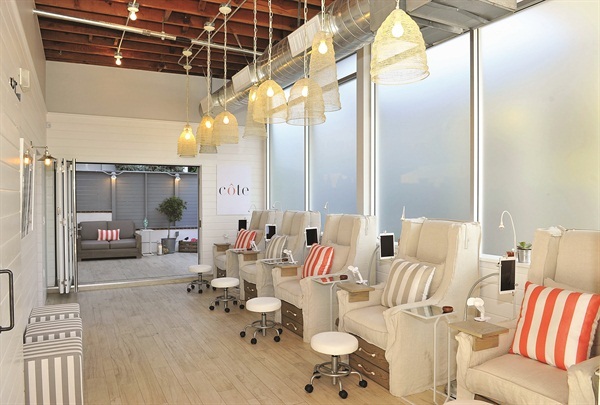 With a unique business model, fresh retail items, and its own line of polishes, this beach-chic salon in Los Angeles creates a weekly retreat for customers. Côte cofounders Mary Lennon and Leah Yari struggled to find a salon that offered both safe and affordable services in the Brentwood neighborhood of Los Angeles. 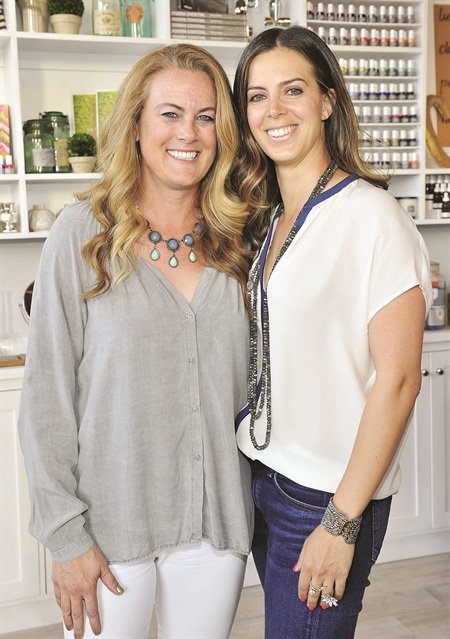 So, over the course of the last year, the two women pursued not only a boutique-style salon with the kind of service and environment they wanted as customers, but also an exclusive line of five-free polishes and a large, custom-curated retail section. 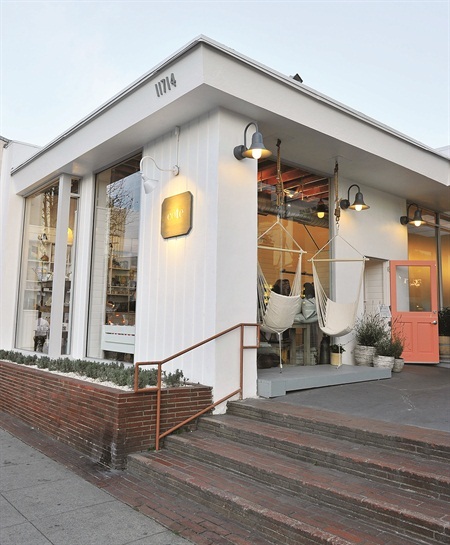 When Lennon and Yari opened their flagship store in March, they wanted specific, simple, and reasonably priced services that customers would happily have done on a weekly basis. Yari explains that when she was pregnant with her second child, she discovered the potential dangers of polishes with ingredients such as camphor and formaldehyde resin. Plus, the strong polish and acrylic smell was a turn off to her when visiting salons, especially as she got further along in her pregnancy. So, she and Lennon decided to only offer a safer, five-free experience for their clients. The options simply consist of the Luxe or Classic manicures or pedicures, a Petit service for children under 12, and a hot stone foot massage. Every treatment ends with a layer of SPF protection, since hands are generally the first areas to show signs of sun damage and aging. 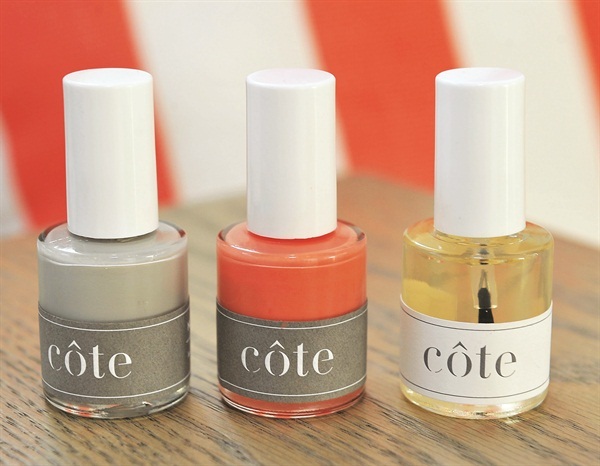 Yari says that while the nail techs at Côte do offer nail art, it isn’t advertised as much as the other services because she and Lennon wanted to ensure a service that would remain timeless despite the ever-changing trends in the nail world. While customers enjoy their service, they can also use the iPads located at each station, rather than a bulky slew of magazines. Plus, they offer refreshing beverages to go with their manicure or pedicure. All of the treatments are under $45, making this salon affordable in an otherwise expensive neighborhood. “We really wanted this place to be an escape that people can afford every week, not just on special occasions,” says Yari. What makes Côte stand out is the intentional and on-point decor. 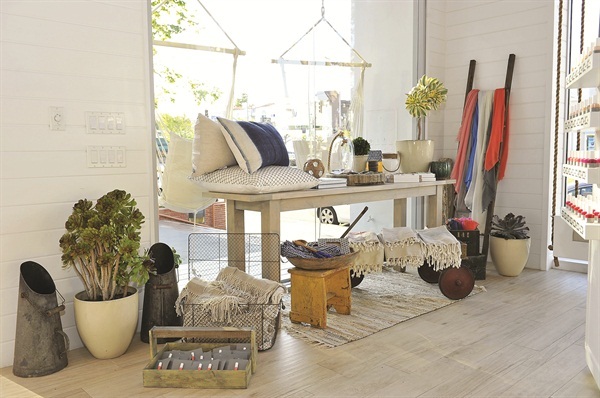 The beach-themed art — hand-selected by a local artist — the blue, white, coral, and sand colored interior, and the custom-made pedicure stations all play a part in a beach-chic theme meant to relax and rejuvenate the client. In addition to the iPads at each station, the chairs, where both the manis and pedis are done, have two pull-out ledges: one for the adult pedicure service and another that is sized and suited for younger patrons. There are also stations available outside under a sheer cover that works in the temperate Los Angeles climate. Because the owners worked hard to give the salon a boutique and minimalist feel, the space is also available to rent for events such as birthday parties and showers. 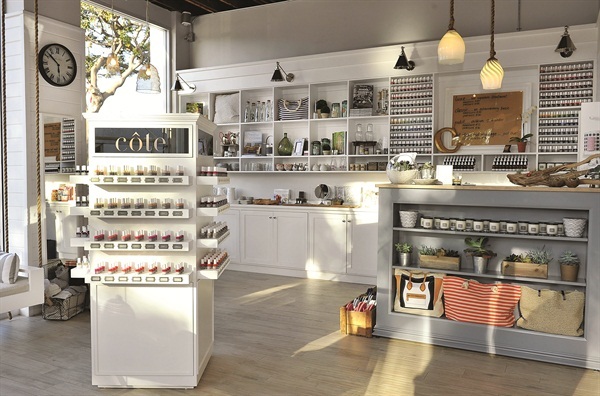 What solidifies Côte’s exclusive ambiance is its retail section. With a variety of jewelry and attire, Yari worked to curate a collection of items that customers can use at the beach. Everything in the salon, including the paintings and tables products are displayed on, is for sale. Plus, they never restock items but rather find new products to offer so that clients always have the option of different and new pieces even if they come into the salon weekly. When Yari and Lennon initially decided on creating a safe, luxurious nail care destination, they wanted their polishes to go beyond the traditional three-free formula, so they formulated their own five- and cruelty-free, vegan polishes. With 109 colors to choose from, each polish is numbered rather than named to keep things simple and straightforward. Of course, they are for purchase if a customer wants to touch up at home, but the two cofounders also offer travel bottles of the strengthening base and top coat in the shape of perfume samplers that clients can take with them on vacation to keep their manicure fresh. These bottles are custom-created to ensure durability so there is no breakage in a suitcase or travel bag. Cleanliness is also something Côte likes to guarantee for customers, so if clients are interested, they are able to purchase a shop box. The box comes with a set of tools and is stored at the salon for each client’s own personal use. The box also includes Côte’s base and top coat, and a personal set of headphones to plug into the iPads. The hope is that as customers experiment with different colors, they will purchase their own bottles to be kept in the box as well. Finally, Côte remains dedicated not only to an excellent customer experience, but also to an excellent experience for the nail technician. Yari says that it’s important for the techs and other employees to feel at home in the space because she and Lennon want the staff to feel comfortable and like equal members of a team. It took a few months of searching, but ultimately she says the team she currently employs feels like the right fit. With all its success, Yari and Lennon are excited to announce that they plan to open two new locations in the Southern California area.